While Nihilego has started to see some small play, I want to talk about its role in the 2018 format and why it has the potential to become a really strong anti-meta pick that can threaten a lot of common Pokemon. Nihilego has great matchups versus the right Pokemon that can make it a big threat for the same reasons it was really good in the 2017 format. A big reason Nihilego was great in 2017 was how much it could threaten common Pokemon in that format. With its 2 main moves in Sludge Bomb and Power Gem, it could threaten the Tapu Pokemon and common fire types like Alolan Marowak and Arcanine as well as Pokemon like Gyarados and Salamence and could even potentially chunk Celesteela. It would commonly carry a coverage move in Hidden Power [Ice] which could threaten a KO on Garchomp. It could achieve these things by holding a Life Orb to increase its damage output although some held a Focus Sash to play it safe. Nihilego also would sometimes carry Trick Room as Andrew Nowak showed on his winning Madison Regionals team and Justin Burns with his winning Seattle Regionals team. These Nihilego were bulkier than the offensive variants, holding either healing berries or the Grassy Seed when paired with Tapu Bulu to make sure it could survive Garchomp's Earthquake, which surprised players. Another interesting item was Choice Scarf which the idea was to outspeed Pokemon it otherwise wouldn't such as Tapu Koko and Garchomp to try and KO them. Sometime more interesting these Nihilego would do is to use Acid Spray to lower its target's Special Defense stat, as shown by Nils Dunlop at the 2017 World Championships. What his Nihilego would do is move first to weaken the target's Special Defense stat and go for a very powerful attack such as Tapu Koko's Thunderbolt to try and pick up a big KO. The sample Nihilego set today is based on the most common item Nihilego uses on Pokemon Showdown and BattleSpot at 22.5%, followed by Rockium Z at 16% usage. 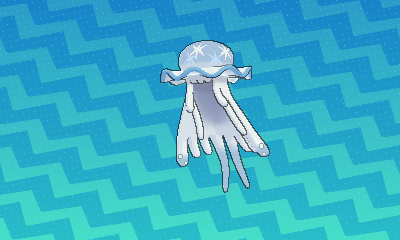 As touched on earlier, what this Nihilego succeeds in is being an unexpected threat that can pick up some KOs your opponent may not expect. With the Choice Scarf, Nihilego's speed stat jumps to 232 which outspeeds Pokemon such as neutral nature Choice Scarf Garchomp, positive speed nature Pheromosa, and even some Swift Swim Ludicolo that aren't very fast. These moves play into allowing Nihilego to do as much work as possible in either tearing through teams or helping out its partner. Power Gem is its primary Rock type attack which is great for hitting Pokemon such as Charizard, Incineroar, and Zapdos that can potentially fall in only one hit. Sludge Bomb is great for hitting common fairy types such as the Tapus as well as Gardevoir, Azumarill, and Clefairy. As touched on above, Acid Spray is great to weaken its opponent's Special Defense stat to allow for its partner to pick up a KO. For example, Mega Charizard Y's Sun boosted Overheat has been regarded as players for having the strength as a Z-Move due to its already massive damage output. Thanks to Nihilego's Acid Spray, this could turn this already insanely powerful move that only a small pool of Pokemon will enjoy taking and Pokemon like Cresselia and Tapu Fini that might take it otherwise could potentially fall to it. The final move in Hidden Power [Ice] is mainly here to threaten KOs on Landorus-Therian. Do keep in mind that the common Assault Vest variants will live and KO in return with Earthquake but the other ones will be knocked out if it isn't faster. The idea behind a Wiki Berry is to give Nihilego the option to take a hit and have the potential to heal up a large amount of health. These Nihilego typically invest a lot of its EVs into its HP and Defense stats which can make it surprisingly bulky on the physical side. Life Orb is a more traditional item which is great for trying to pick up KOs. This was a very common item in 2017 as these Nihilego were very scary all throughout the season. Focus Sash is also a very common item. The difference with how a Focus Sash variant plays rather than a Life Orb variant is the Focus Sash allows you to Protect in front of the more annoying Z-Moves. I've seen these Nihilego Protect in front of Landorus' Tectonic Rage and survive thanks to its Focus Sash which can be very clutch. Rockium Z turns its already powerful main Rock type move in Power Gem into a very powerful Z-move. It's great for going for a very powerful Continental Crush which can pick up some big KOs on Pokemon like Zapdos and Incineroar that can survive a Power Gem but not a Continental Crush which is very big. The final item in Grassy Seed plays into a bulkier Nihilego like the berry ones, but it means Nihilego loves Tapu Bulu's Grassy Surge ability as it allows it to increase its defense stat and thanks to shuffling Intimidate from Pokemon like Arcanine back in 2017 or Incineroar now in 2018, can allow Nihilego to take Earthquake from Landorus-T if Grassy Terrain is active. This section will show the common Pokemon that won't enjoy taking its attacks. Pokemon shown will take super-effective damage from its moves. Pokemon that are weak to both moves will be put into their proper categories. Tapu Bulu can set Grassy Terrain to help Nihilego take Earthquake better. Tapu Bulu's grass type moves can also hit Ground types such as Landorus-Therian and Excadrill for major damage and can even threaten a KO. Nihilego can also threaten the Fire types that Tapu Bulu doesnt enjoy dealing with by threatening them with Sludge Bomb. Incineroar's fire type moves can threaten the Steel types like Celesteela and Ferrothorn with super-effective damage using its main move in Flare Blitz. It also gets Intimidate which can help compensate for Nihilego's weak defenses. In return Nihilego can threaten the most common Water type in Tapu Fini with Sludge Bomb. Landorus' access to Ground type attacks with Earthquake on the physical side and Earth Power on the special side. Nihilego can threaten a KO with Hidden Power [Ice], but the Assault Vest variants of Landorus will survive this attack and easily KO in return. As the 3 most common steel type Pokemon that use steel type moves, what all 3 do very well is being able to wall out Nihilego by easily being able to take its hits and easily KO using the Steel type move of its choice in Celesteela's Heavy Slam, Ferrothorn's Gyro Ball, and Metagross' Iron Head. Keep in mind Celesteela doesn't resist Power Gem like the other 2, but still doesn't take much damage from it. Tapu Lele can deal with Nihilego but in this situation, it becomes tricky for both Pokemon. If Nihilego can outspeed or has a Focus Sash, Sludge Bomb can KO Tapu Lele. If Tapu Lele can outspeed, which it will either need a Choice Scarf or Tailwind up to do so, it can go for Psychic to KO. This will rely on Psychic Terrain being up to guarantee the knockout but even without it, the damage rolls favor Tapu Lele. As explained throughout this article, Nihilego has a lot of positive match-ups versus a lot of common Pokemon in the format. Being able to come on the battlefield and have a pretty good chance of threatening one of your opponent's Pokemon is amazing as it means almost always, Nihilego can threaten your opponent by looking like a huge threat. If you can position your Nihilego correctly and support it by building off of what the areas its lacking, it can become a huge threat.